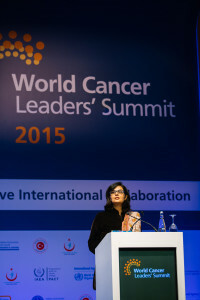 November 25, 2015: The World Cancer Leaders’ Summit, an annual high level convening hosted by the Union for International Cancer Control (UICC) was held in Istanbul on November 18, 2015. The meeting “provides an important forum to secure a coordinated, multileveled global response to address the spiraling cancer epidemic”. UICC is a Geneva based apex body with a membership of 900 organizations across 155 countries. Since the summit was held immediately after the UN’s pronouncement of the Sustainable Development Goals with their focus on partnerships as a key lever of delivery, its theme centered on international collaboration. October 29, 2015: The Ending Childhood Obesity Commission recently held its European regional consultation in Malta on October 29 and 30. The meeting was organized by the World Health Organization EURO regional office and the Government of Malta and was attended by countries from the region. This consultation is the last in a series of regional consultations, the Commission is holding globally to seek regional perspectives on the issue. The meeting was chaired by our President, Dr. Sania Nishtar, who co-chairs the Commission on Ending Childhood Obesity along with Sir Peter Gluckman, Science Advisor to the Prime Minister of New Zealand.